Does Kerry have a deal on Syria? Kerry is on the fast-track to becoming the most influential Secretary of State since Kissinger. 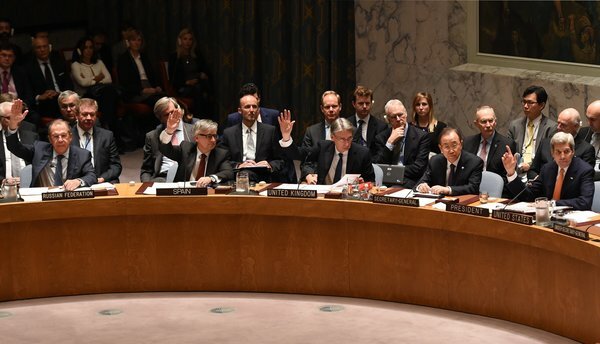 The UNSC resolution on Syria is nothing short of a diplomatic breakthrough. The optics of the UNSC action suggest that we may indeed have a deal. Whether or not you think Assad should be ousted, a ceasefire and dialogue in Syria would be cause for celebration. There are still fairly big outstanding issues before a great power settlement in Syria can be achieved: How long shall Assad stay? And which groups shall be accommodated in the political process? The first is simple, but the second is fiendishly complex. The hard truth about Assad is that Russian and US interests are largely congruent in the near term: Both require Assad to stick around until a replacement can be secured without destabilizing the Syrian state. Kerry has likely persuaded Putin that no political accommodation is possible in Syria without putting an expiry date on Assad. For a deal, the two must conclude bargaining over the expiry date: Shall it be sixteen months or twenty? What to do with the hundreds of militias fighting and holding territory in Syria is the hard problem. Which militias shall be recognized politically? Which are to be excluded politically but not hunted down? And which shall be militarily eliminated? Jordan, a US protectorate, is compiling the elimination list. So far, only two, ISIS and JN, have been included. It is unlikely that small groups that hold little territory will be added to the list. Hanging in the balance is Ahrar al-Sham. Ahrar al-Sham is a Salafist-Jihadist group that runs Aleppo and is now allied to US-backed groups. It is not exactly a secret that Ahrar is a Turkish client. No doubt the Russians are seeking its inclusion on the list of outlaws. There are observers arguing that the US should establish a working relationship with Ahrar al-Sham. Even more would likely oppose military action against the group. Others might argue that all Salafist-Jihadist groups should be on Jordan’s list. It is not clear that the group should be included. Even though Ahrar swears allegiance to Al Qaeda, it has staked a unique position at the dovish end of the spectrum in the Salafist-Jihadist civil war. Whereas ISIS is determined to use an ultra-violent grand strategy to reestablish the Islamic State, Ahrar now shuns attacking civilians and seeks to win hearts and minds instead. It now says that it wants to peacefully persuade people to establish an Islamic state in Syria. And unlike ISIS and JN, Ahrar does not start doling out the harshest sharia punishments as soon as it occupies a town. Ahrar even reached out to the US publicly—by writing an oped in Washington’s leading newspaper! US intelligence should certainly talk to the group. However, the United States should not think of the group as an ally. It is not. It’s core program remains a threat to US interests. And while it may make purring sounds, its strategies and intentions may change dramatically. Indeed, the right strategy is to oppose the expansion of its influence. In particular, the United States should come up with a strategy to ensure that Ahrar al-Sham does not fill the vacuum left by JN. ← Will Anyone Call ISIS’ Bluff?